This post does contain affiliate links. Bear with me. So this started, initially, as a multi-part blog post series. Specifically, the art got complicated, and I wasn’t able to make a new blog post each week to detail the process of making this thing. Let’s go into the details, though, so I can show you WHY this art took so long. And also how I make big illustrations like this one. 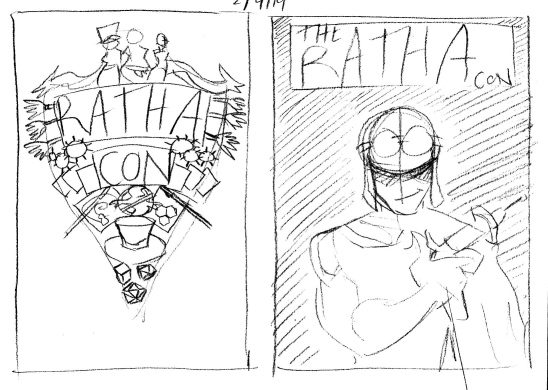 Thumbnails are what I like to call the really rough sketches of an idea. It’s something I borrowed from animation film language. I already wrote a post about this step, which you can read here. I wrote about why I choose this design, as well as the details of it, in the second part of the blog series. Now I’m going to get into the how. 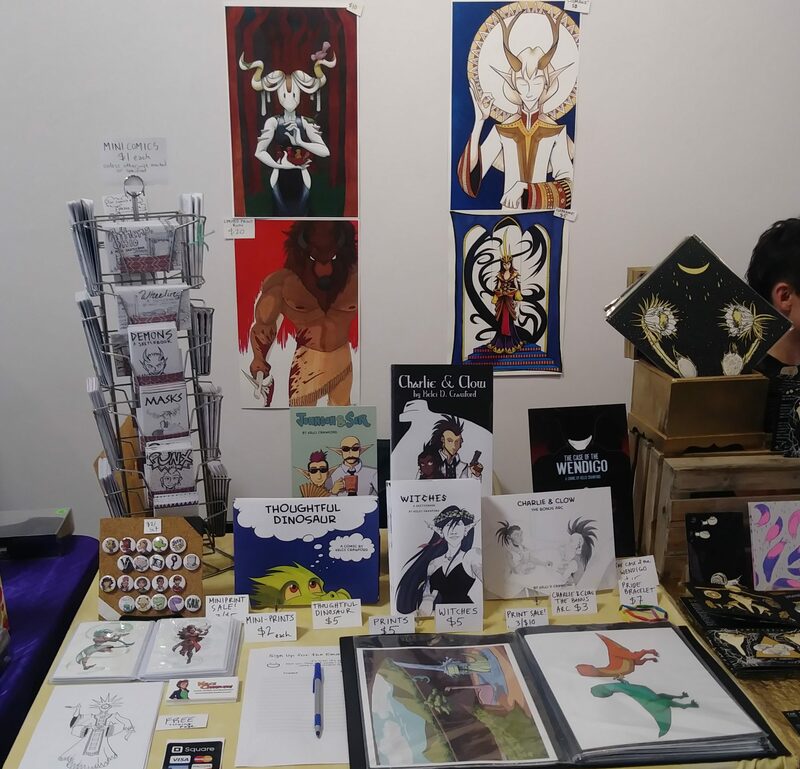 It took a little while for the email chain with the convention staff to start (another reason that the weekly blog post idea had to get pushed). But once it got going, I was able to get feedback and get to work. Pencils – or, the sketched the version of a thing – is something I do with just one pencil in one go. When I first started in comics, I USED to do the undersketch with one pencil (usually a 2H), then the top layer in a darker tone (like B). Now, I do all of my pencilling with just one pencil. Usually a mechanical one. I believe the RathaCon art was drawn with my Tombow monograph mechanical pencil, but right now I am in LOVE with the Zebra DelGuard mechanical pencil. This step takes a deceptively long time. It takes a long time for me because I try to control the line weight as much as possible: making some areas dark with a bolder line, but light with a lighter line. Inking is also the stage where I have to squint at my pencil drawing and determine what lines will look the best when inked. Because pencils are when I get real loose. Inks are where things get tight and snappy. Depending on the piece, I’ll make it either traditional-only (usually with Copic markers). Or I make it a combination of traditional and digital. Or I have all the colors be digital. At this stage I go back over the art in Clip Studio Paint and erase any stray marks, fix any color bleeds, and generally just clean the piece up. I also like to adjust how much the colors pop at this stage. So I play with the levels a little. 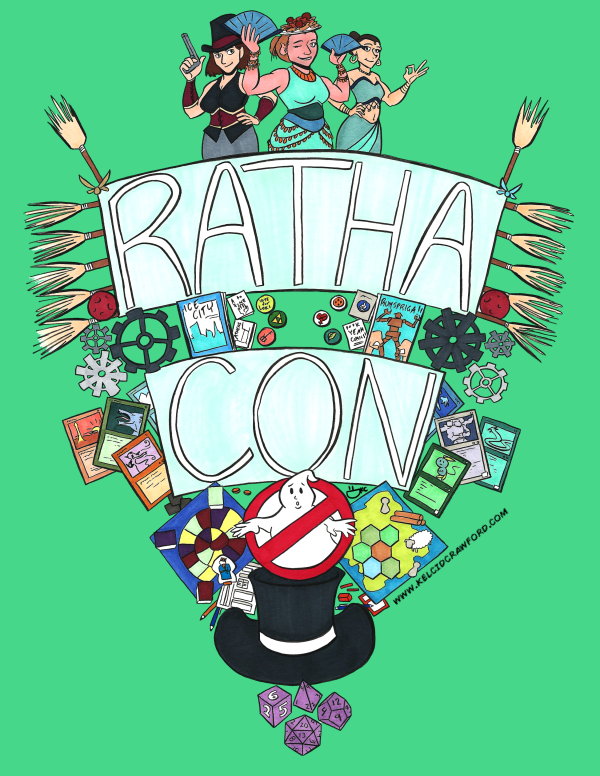 With the RathaCon art, the only digital color I needed to add was the background tint. In almost any other piece, I’ll add a layer over the art in Clip Studio Paint in order to add shadows. These make the art pop even more. I originally made the art for this print at 11 x 17 inches. 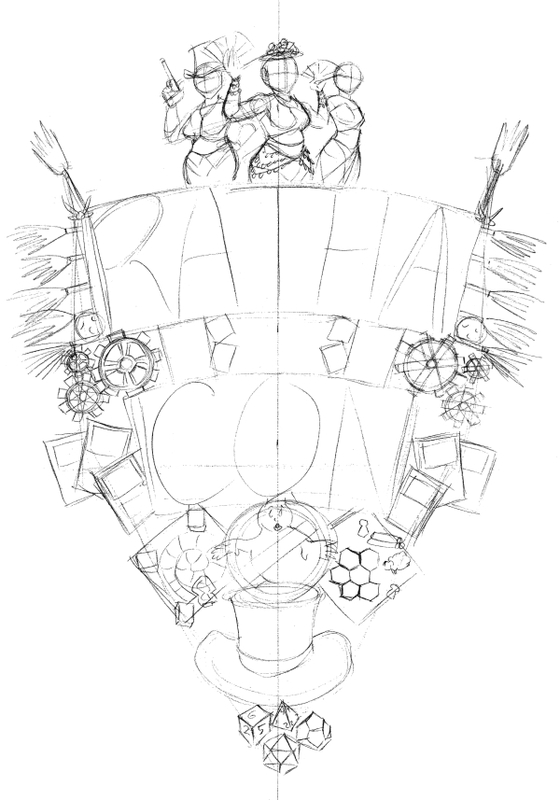 About a week ago, the RathaCon staff asked if I could make the piece an 8.5 x 11 inch one instead. Pro tip: it’s WAY EASIER to shrink an illustration than to enlarge it. It took a little wiggling to keep the scale of the piece consistent and not accidentally cut off bits of it. But a new scale was figured out. 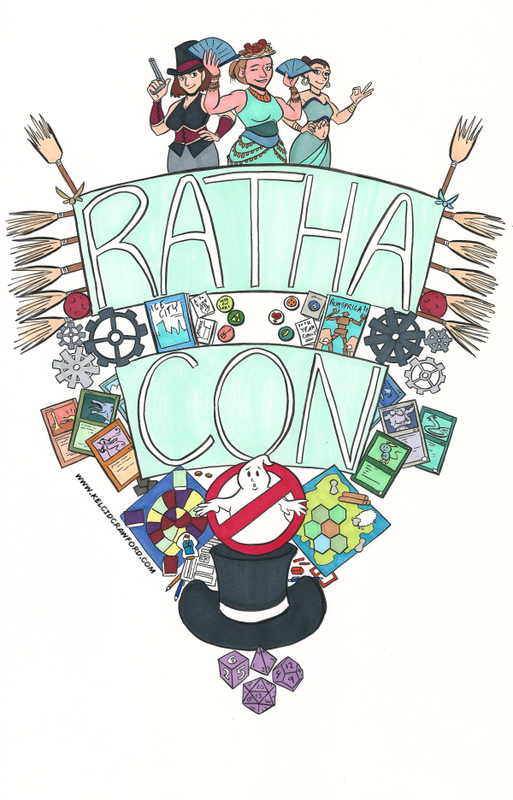 As I mentioned, this art will be available as a limited edition 8.5 x 11 inch print at RathaCon, for $10 a piece. So if you’re in Athens, OH on April 27, I hope you get it! This is a limited print run, so once it’s gone – it’s gone. I’ll have these beauties for sale at my table, and they’ll also be available at the RathaCon official table.